Since time is quickly running out, I decided that I would use my time today to it's fullest and work on a couple things at a time. While I was finishing up an Eldar project, I dumped out all the bits I had for my part of the Storm Wardens army and started taking inventory. 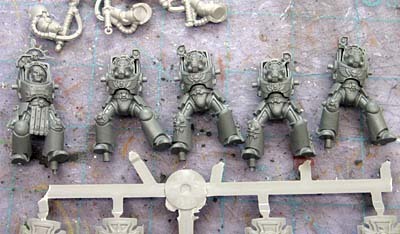 John over at Santa Cruz Warhammer sent me plenty of stuff to make a 5 man Terminator Assault Squad. MisterJustin is sending me the resin bases and Mik sent me a Command Squad Banner Bearer. It's amazing how much is going on with the group. There have been over 300 emails that have come across my computer so far related to the project... and that's just the stuff involving me. But back to the Terminators. There is so much I'd love to do with this unit, but I'm strapped for time (the final date of mid July is quickly approaching) and I've got tons of other things already underway like the rest of the guys. So the trick will be balancing what I have with what I want to do with the time I have to do it in. This means I won't be able to do everything I want, so I'll have to choose those elements that really enhance the squad. Things like simple conversions and sculpting to really make these guys into Storm Warden Inheritors. Inheritors being what the members of the First Company call themselves after the Nemesis Incident. They are the custodians of the Chapter’s honour until the day their ancestors rise from their timeless slumber. I'm shooting for simple and effective with these guys. 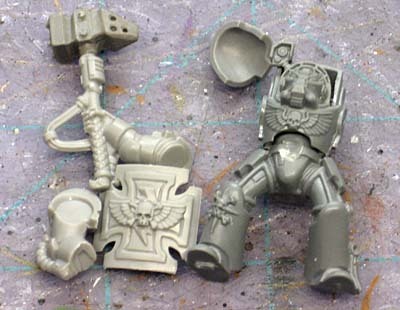 They won't have tons of bells and whistles, but will have sculpted shoulder pads, converted thunderhammers, specific storm shields and some additional iconography added in a few places here and there. Really looking forward to how these turn out! Goodluck juggling it all. Good luck getting it done! Any news on how much has been raised for Docs WB yet? Seriously though, looking forward to the next update. Less may actually be better with these guys, I think (given the colourscheme and background) that a few distinct, differentiating features with some strong painting will really do the trick on these. Best of luck with them and naturally have fun working on them as well! FoxPhoenix135: I just don't know where all my time goes these days. I'm just trying to stay afloat sometimes. I managed to get a good bit done on these guys the other day between other jobs, so I plan on posting another update once I can get some sculpting started and maybe even get them mounted on their bases.